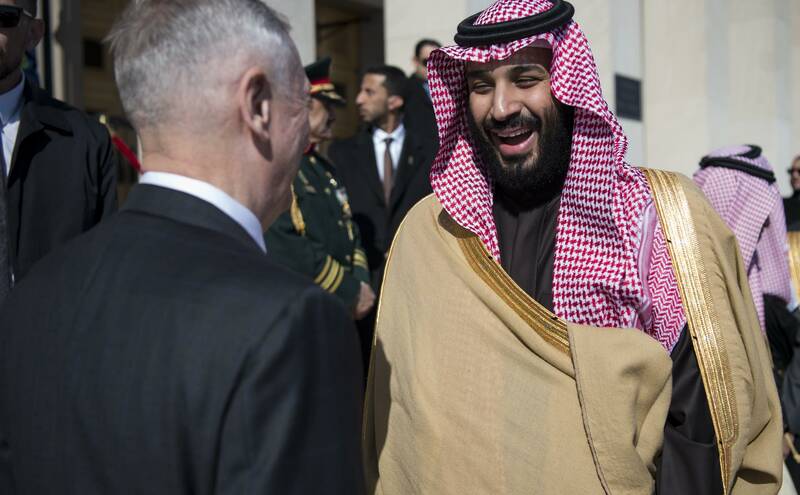 Saudi Crown Prince Mohammed bin Salman has been on an extended tour of the United States, trying to present a friendly face to the American public and bring them on side in the same way he’s won over the Trump administration. This began with a 60 Minutes extended interview filmed in Riyadh, and was followed in the US by a wide-ranging but soft interview with The Atlantic which has provided much grist to the commentary mill. The fact that Salman conducts these interviews says a lot about his (and his advisers’) understanding of the social media age. It also demonstrates an understanding that under the Trump administration, Saudi Arabia has an opportunity to further its policy goals. Saudi society’s incompatibility with Western social values and, more recently, the stagnating and increasingly bloody military campaign in Yemen requires duchessing of the American public, which in turn requires a media campaign. Hitler tried to conquer Europe … the Supreme Leader is trying to conquer the world. By now, nobody should be in any doubt as to Salman’s attitude towards Iran, but he went further, seeking to conflate evils and create his own “brand” by lumping Iran, the Muslim Brotherhood, and radical Islamists together as part of what he dubbed the “Triangle of Evil”. As a marketing tool, it didn’t fly. This is instructive for no other reason than the fact it reflects Saudi Arabia’s penchant for denialism. In the early 2000s, Saudi authorities blamed a series of attacks against Westerners on an internal gang-related war over illegal alcohol rather than on Islamists. This persisted until al-Qaeda launched a series of attacks against Riyadh compounds in May 2003 and Saudi authorities could no longer deny their presence. I believe the Palestinians and the Israelis have the right to have their own land. This was a very deliberate ploy to bring the increasing thaw in relations between Israel and Saudi Arabia more into the open. But it was also targeted at Jewish Americans and at Tehran, to let them know that (unacknowledged) Israeli–Saudi cooperation against Iran in the region shouldn’t be discounted. And there was plenty of syllogistic reasoning in an attempt to make two plus two equal five. Salman pushed several nonsensical lines of argument based on cherry-picked facts rather than logic. Absolute monarchy is not a threat to any country ... If it were not for absolute monarchy, you wouldn’t have the United States. The absolute monarch in France helped the creation of the United States by giving it support. Absolute monarchy is not an enemy of the United States. It’s been an ally for a very long time. France was an absolute monarchy that helped the US. Therefore, the US owes its creation to an absolute monarchy. A somewhat grandiose claim that Americans themselves may think underplays the role of the early revolutionaries. And in the case of the French monarchy, it was gone within a generation after the War of Independence concluded, so to claim absolute monarchies and the US have been allies for a “very long time” flies in the face of Salman’s own historical analogy.